Every year, it seems, civil discourse in the U.S.A. hits a new low. Actually, that’s not entirely accurate—Americans have always talked to each other like we’re pieces of human garbage, waiting to be taken to the curb, shipped to a barge somewhere in the middle of the ocean, and dropped into the watery depths. The problem is more that public spheres in which we expect there to be a modicum of dignity are being progressively robbed of what little remaining sense of respect and decorum may once have attached themselves to such arenas. The 20th century may have been a graveyard of utopian projects, but it did seem to contain the possibility of a political discourse not predicated on outright disgust and hatred of the other. Luckily, we still have some willing to carry the torch for the American project of tolerance, open-mindedness, and disagreement without disparagement. These noble souls hold fast to the ideology of good neighbors, bound together by common interest, even if the political visions to which they ascribe diverge wildly in both concept and practice. A dream of the vox populi as caring acquaintances cohabiting town and country, united in care for one another despite conflicting views of the role of government and civil society. These people will come together to debate one another, in mutual respect and commitment to a better world. Oh, and simultaneously, somewhere else, the person who thought the title Uganda Be Kidding Me was a comedic masterstroke will be talking to that woman who thinks Syrian refugee children are cowards. 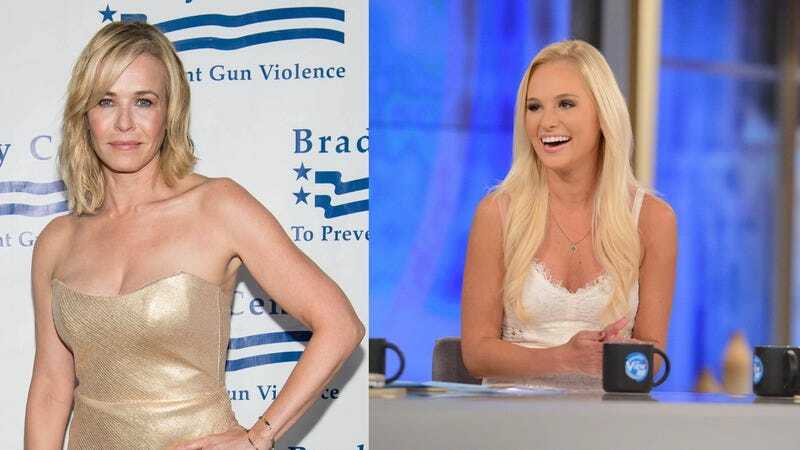 The Daily Beast reports Netflix show host Chelsea Handler is set to debate right-wing opportunist and sort-of talking head Tomi Lahren later this month at Politicon, a political convention set to launch its third outing July 29-30 in Pasadena, CA. Handler has spent the past few years slowly transitioning from making offensive jokes about minorities and reality-TV stars to providing thin analyses of political and social issues, all while still managing to not be terribly funny while doing so. Still, it’s an evolution of sorts, or at least a lateral move, one that will now include having to treat Tomi Lahren as some sort of person with ideas serious enough that she can defend them in a genuine back-and-forth exchange, something Lahren has previously managed to achieve with Trevor Noah. The live conversation will hopefully go somewhat more smoothly than an earlier one Handler had planned with Anne Coulter, who presumably has since realized trying to be funny in the proximity of even mildly talented comedians isn’t a good look for her.